Astronomers using ESA and NASA high-energy observatories have discovered a tantalizing clue that hints at an elusive ingredient of our Universe: dark matter. Although thought to be invisible, neither emitting nor absorbing light, dark matter can be detected through its gravitational influence on the movements and appearance of other objects in the Universe, such as stars or galaxies. Based on this indirect evidence, astronomers believe that dark matter is the dominant type of matter in the Universe – yet it remains obscure. 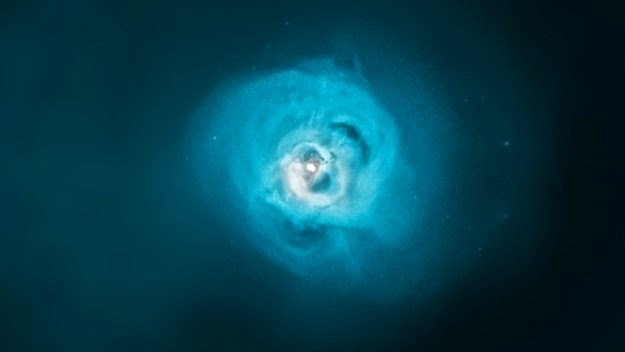 Now a hint may have been found by studying galaxy clusters, the largest cosmic assemblies of matter bound together by gravity. Galaxy clusters not only contain hundreds of galaxies, but also a huge amount of hot gas filling the space between them. However, measuring the gravitational influence of such clusters shows that the galaxies and gas make up only about a fifth of the total mass – the rest is thought to be dark matter. The gas is mainly hydrogen and, at over 10 million degrees celsius, is hot enough to emit X-rays. Traces of other elements contribute additional X-ray ‘lines’ at specific wavelengths. Examining observations by ESA’s XMM-Newton and NASA’s Chandra spaceborne telescopes of these characteristic lines in 73 galaxy clusters, astronomers stumbled on an intriguing faint line at a wavelength where none had been seen before. “If this strange signal had been caused by a known element present in the gas, it should have left other signals in the X-ray light at other well-known wavelengths, but none of these were recorded,” says Dr Esra Bulbul from the Harvard-Smithsonian Center for Astrophysics in Cambridge, Massachusetts, USA, lead author of the paper discussing the results. The astronomers suggest that the emission may be created by the decay of an exotic type of subatomic particle known as a ‘sterile neutrino’, which is predicted but not yet detected. Ordinary neutrinos are very low-mass particles that interact only rarely with matter via the so-called weak nuclear force as well as via gravity. Sterile neutrinos are thought to interact with ordinary matter through gravity alone, making them a possible candidate as dark matter. “If the interpretation of our new observations is correct, at least part of the dark matter in galaxy clusters could consist of sterile neutrinos,” says Dr Bulbul.